Objective: Treatment of chronic urticaria (CU) can be difficult in many patients. Achieving long-term remission and reducing the requirement of antihistamines are vital in CU. The objective of this study was to assess the effectiveness of injection histaglobulin, a complex of histamine and human immunoglobulin, in producing relief in patients with CU. Materials and Methods: Fifty-one patients with CU were enrolled into this prospective clinical study. Patients were administered 1 ml of injection histaglobulin subcutaneous for 8 consecutive weeks. They were also prescribed tablet levocetirizine 5 mg to be taken when required (but not more than the permitted dosage). 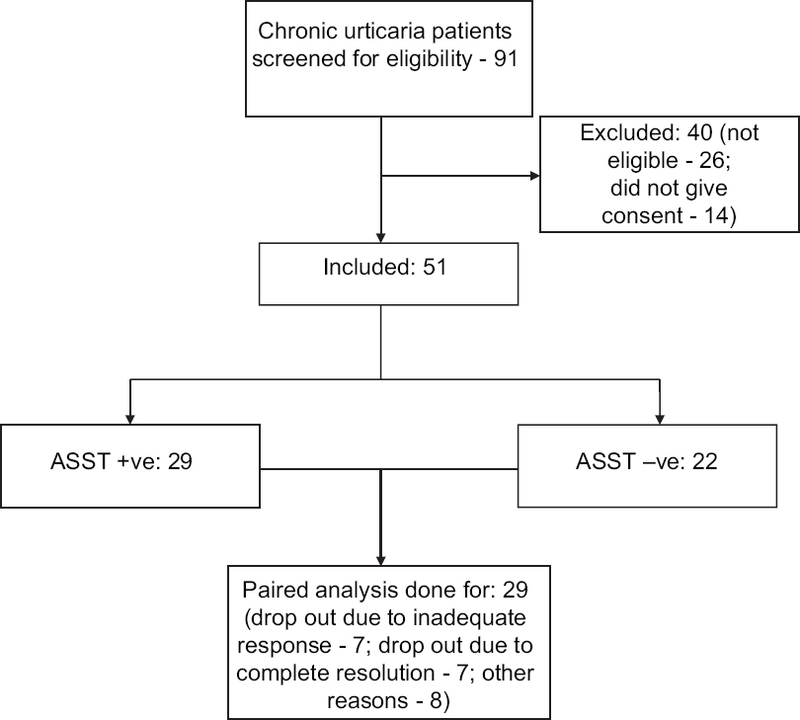 Efficacy was assessed using urticaria activity score (UAS) which has a maximum score of 33/day, during each weekly visit. Final assessment was done after 24 weeks. Results: Twenty-nine patients had completed the entire 8-week drug regimen. Mean basal UAS was 18.9 ± 6.3 and it reduced to 80.4% by 8 weeks. The angioedema sub-score reduced by 89.8%. Anti-histamine pill burden also reduced significantly. By 24 weeks of starting the therapy, 23 patients (45%) had attained complete remission. No adverse effects to the drug were observed. Conclusions: Histaglobulin was found to be effective in producing long-term remission and it reduced the antihistamine requirement as well. Thus, it can serve as an effective alternative to existing treatment modalities. Chronic urticaria (CU) is defined as urticaria persisting daily or almost daily for more than 6 weeks. The exact prevalence of CU is unknown. About 0.1–3% of the population are affected by this condition. Various therapeutic options are available for the treatment of CU. First in the treatment ladder are nonsedative antihistamines, which are initially started at a low dose. Escalation of the dosage of these agents and adding a leukotriene antagonist are the next strategies in the management. The use of immunomodulators such as cyclosporin, methotrexate, omalizumab, and dapsone is the last resort in treating this condition. Ordinary CU has a fluctuating course and often a poor response to drug treatment. It can be challenging to determine the appropriate medication to suit the patient. The need for long-term and daily intake of these agents leads to frustration and noncompliance. Treatment options which increase the duration of remission and those which address the key factors involved in the disease pathogenesis are the need of the hour. In this context, we assessed the effectiveness of injection histaglobulin, a complex of histamine and human immunoglobulin, in producing relief in patients with CU. This prospective clinical study was carried out in the dermatology out-patient department (OPD) of our institute from November 2013 to October 2014. The study was initiated after obtaining the approval of Institutional Ethics Committee. The study is registered in the Clinical Trials Registry-India the Registration No. : CTRI/2015/01/005447. Chronic spontaneous urticaria was diagnosed if the patient had a history of daily or almost daily occurrence of widespread, itchy, spontaneous wheals for a period of 6 weeks or more, with individual lesions lasting <24 h. Patients younger than 18 years, pregnant and lactating mothers, patients on long-term immunosuppressants for CU, and those with any other comorbidity were excluded from the study. Possible physical urticaria such as cold-induced, pressure, heat-contact, solar, dermographic, vibratory, aquagenic, cholinergic, and drug-induced urticaria were excluded from the study. Based on the study by Tseng et al ., the minimum target sample size was calculated to be 51. This was calculated to estimate the mean urticaria activity score (UAS) score after 8 weeks of treatment for CU with 90% power and 5% probability of Type 1 error, a standard deviation (SD) of 3.5 for this parameter, the absolute error as 1.00, and considering possible 10% dropouts. Thus, after screening 91 patients with CU who visited the OPD during the study period, 51 patients were enrolled into the study. Informed consent was obtained from the patients and baseline evaluation was done. This comprised a detailed history regarding the duration, severity, diurnal variation of lesions, presence or absence of angioedema, any systemic comorbidities, such as thyroid disorders, diabetes mellitus, or hypertension, and any concomitant drug use by the patient, and a history suggestive of any physical form of urticaria or urticarial vasculitis. Female patients' status on pregnancy or lactation was also noted. This was followed by a clinical examination of the patient. Elicitation of dermographism, blood pressure cuff for delayed pressure urticaria, vibratory motor for vibration-induced urticaria, hot water test tube for cholinergic urticaria, and ice cube test for cold-induced urticaria were performed, wherever appropriate to exclude physical urticaria in suspected cases. The baseline UAS was calculated, and the number and type of oral antihistamine the patient was taking in the past week were noted. Routine investigations such as complete blood count with differential count, urine routine examination, stool examination for ova and cysts, thyroid profile, and renal and liver function tests, were done for subjects. An autologous serum skin test (ASST) was then performed as per the standard procedure, accordingly patients were divided into subgroups as ASST +ve patients and ASST –ve patients. The patients were then administered a subcutaneous injection of 1 ml histaglobulin (HISTOGLOB ® manufactured by Bharat Serums and Vaccines Ltd, Maharashtra, India), which is a combination of human normal immunoglobulin (12 mg) and histamine dihydrochloride (0.15 mcg). The recruited patients were administered 1 ml of histaglobulin subcutaneously over the arm, weekly for 8 consecutive weeks. Patients were also prescribed rescue medication (tablet levocetirizine 5 mg) to be taken when required, not exceeding the permitted daily dosage. During each weekly visit, the response to treatment was assessed using UAS. The number of rescue medications taken in the past week was also noted. Final assessment was done at 24th week of starting the therapy. The UAS used by Tseng et al . was used, which assessed the severity of both urticaria and angioedema. It assessed four parameters, namely, the wheal, erythema, pruritus, and angioedema. The wheal, erythema, and angioedema were scored based on number, size, and duration. Pruritus was scored based on its intensity and duration. The sum of the scores was calculated and the maximum score would be 33/day. Each patient was provided with an urticaria daily sheet, which was modified to suit the needs of our rural study population. Patients were instructed to make entries on a daily basis to be reviewed at each weekly visit. The UAS was assessed weekly and subcutaneous injection procedure was repeated for a period of 8 weeks. At the end of 8 weeks of therapy, patients were instructed to review in the OPD if symptoms reappear. A telephonic interview of disease status was conducted at 24th week. 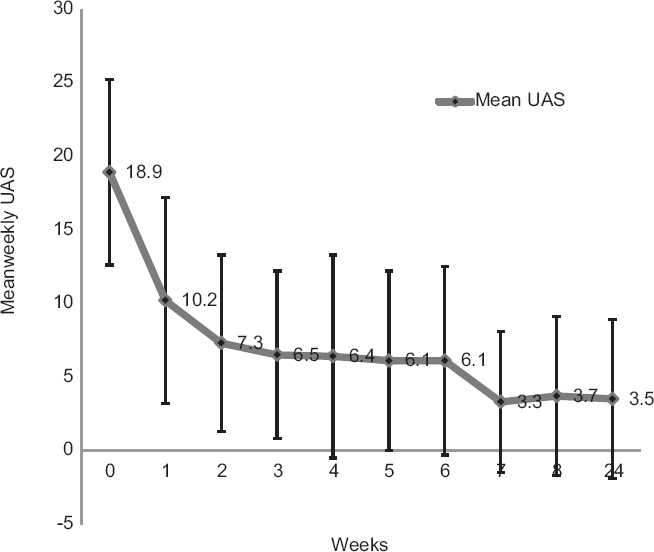 The primary end point was reduction in UAS after 8 weeks of injection histaglobulin. The proportion of patients who achieved complete remission at 24 weeks of therapy was noted. The baseline UAS was calculated as an average of daily scores for the 7 days preceding the screening visit. Similarly, during each visit, UAS was calculated as an average of daily scores for the preceding 7 days. Secondary end points were weekly reduction in UAS and its rate of reduction during the follow-up visits. The time until 50% reduction from the baseline in the severity score was noted. Reduction in the requirement of anti-histamine tablets was also noted. Data were entered and analyzed using SPSS Inc (Released 2007. Version 16.0. Chicago). Frequency, proportion, mean, and SD were calculated. Unpaired t -test was used to compare the means between the groups and Wilcoxon signed rank test was used to compare the pre- and post-treatment UAS scores. Friedman's analysis of variance was used for analyzing repeated measures quantitative data. Pre- and post-treatment values were compared for subjects whose complete data set was available. Post hoc power analysis was done using G*Power 3.1.9.2 (Franz Faul, Universitat Kiel, Germany: G*Power software, 2014). Of the 91 patients who were diagnosed with CU during the study period, 51 patients were included in the study. Of them, 48 patients completed at least 4 weeks and 29 went on to complete the stipulated 8 weeks of treatment. The reasons for withdrawal were complete resolution of symptoms within 4 weeks of starting treatment in seven patients, inadequate response in seven patients, and for other unspecified reasons in eight patients [Figure 1]. Among them, 37 were female and 14 were male (male:female = 1:2.6). The mean age (± SD) of patients was 37.2 ± 13.1. Of the total patients, 49% (n = 25) had urticaria alone and 51% (n = 26) had urticaria with angioedema. Mean duration of the disease was 15.8 ± 18.7 months. Basal ASST was negative in 22 patients (43.1%) and positive in 29 patients (56.9%). The mean basal UAS recorded at the time of screening visit was 18.9 ± 6.3. The baseline UAS was higher among the ASST-positive patients (19.8 ± 5.7) when compared to ASST-negative patients (17.8. ±6.9). Mean baseline angioedema score was 4.9 ± 2.6. Mean number of antihistamines taken per week by patients at baseline evaluation was 7.0 ± 6.7 [Table 1]. Mean UAS value reduced from 18.9 ± 6.3 to 3.7 ± 5.4 (80.4% reduction) by 8 weeks. Among the 29 patients who completed therapy, complete remission (UAS = 0) was observed in 14 patients at 8 weeks. Excellent response (>75% reduction) was observed in 21 patients; good response (51–75% reduction) in one patient; moderate response (25–50% reduction) in six patients; and poor response (<25% reduction) in one patient. By 24 weeks of starting the therapy, 23 patients (45%) had attained complete remission, of which 17 patients had completed the prescribed regimen of 8 weeks. Remaining six patients had taken at least 4 weekly injections continuously. We observed a significant reduction in the UAS score during each week. Onset of response was observed in the 1st week. More than 50% of the reduction in the mean UAS was achieved by the 2nd week. 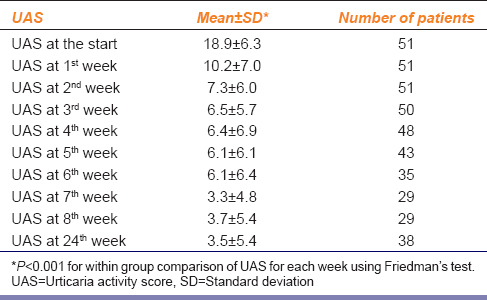 Reduction in mean UAS observed during each week was found to be statistically significant by Friedman test for repeated measures [Table 2] and [Figure 2]. Among ASST-positive patients, the mean UAS reduced from 19.8 ± 5.7 to 3.8 ± 5.8 (80.8% reduction) and among ASST-negative patients, it reduced from 17.80 ± 6.9 to 3.5 ± 4.9 (80.3% reduction). The difference in response between these two groups was not statistically significant (P = 0.85). With respect to the duration of treatment, the patients were grouped into those who were symptomatic for 6 months or less (14 patients) and those with symptoms for more than 6 months (15 patients). The scores reduced by 86.6% and 74.7% in Group 1 and Group 2, respectively (P = 0.17). Angioedema score also reduced from 4.9 ± 2.6 to 0.5 ± 1.7 at the end of treatment (P = 0.002). The mean number of antihistamine tablets required per week reduced from 7.0 ± 6.6 at the start to 1.54 ± 1.7 after 8 weeks (P < 0.001). At 24 weeks, 22 patients were completely off for antihistamines. The summary of all end points is given in [Table 3]. None of the patients reported any adverse effect either during or after the treatment. Among the 14 patients who achieved complete remission during 8 weeks of treatment, urticaria symptoms had relapsed in two patients at 24th week of follow-up. However, urticaria activity continued to remain at a low level among the study subjects (3.5 ± 5.4). CU is a perennial health problem that affects the quality of life of patients. Nonsedating antihistamines remain the main stay of treatment of CU.,,, Although it provides immediate relief from symptoms, it does not alter the immunopathogenesis or the natural course of the disease. There remains a challenge to find a drug which provides long-term benefit by acting on early steps in the immunological cascade, thereby preventing the attacks of urticaria. Various immunological agents that are being used are oral corticosteroids, cyclosporine, methotrexate, intravenous immunoglobulin, omalizumab, tacrolimus, etc., Studies supporting the use of these drugs are limited, and the side effect profile of all these drugs is also not favorable. In this context, histaglobulin, a sterile preparation of histamine dihydrochloride coupled to active protein fraction extracted from human blood (gamma globulin) in strictly defined proportions, is a useful alternative. Gamma globulin used in HISTOGLOB ® is tested negative for hepatitis b surface antigen, HIV-1, 2 antibodies, and hepatitis C virus-ribonucleic acid by polymerase chain reaction as declared by the manufacturer. The exact mechanism of action of histaglobulin is poorly understood. Histaglobulin is capable of eliciting an immunological response with the production of highly potent antihistaminic antibodies. The anti-histamine antibodies formed will neutralize the released histamine and eliminate urticaria effectively. Repeated doses of histaglobulin increase the antibody titer, for which it is recommended to administer doses every 6 months to maintain optimal titer of antibody., Patients may have to take 6 monthly injections till complete clinical remission is achieved. Further studies with longer follow-up period are required to find out the long-term requirement of such doses. Further, in a study done on mice, subcutataneous injection of a complex of histamine and mouse gamma globulin (mγG) markedly reduced the allergen induced eosinophil accumulation in their peritoneum. When administered alone, neither histamine nor mγG produced any effect on eosinophil accumulation. Histamine and globulin have been shown to regulate eosinophil function through their specific receptor. The exact mechanism of inhibition of eosinophil accumulation is not known. The following mechanisms were considered by authors to explain the inhibition of peritoneal eosinophil accumulation. By preferentially suppressing eosinophil chemotaxis, by inducing apoptosis of eosinophils, by selectively inhibiting late antigen-4, vascular cell adhesion molecule, or both, and by suppressing maturation of eosinophils in bone marrow. Histaglobulin has been widely used in the treatment of allergic rhinitis. It is also used in various allergic disorders such as asthma, atopic dermatitis, CU, erythema multiforme, and cutaneous drug allergy. There is a lack of well-designed studies on its efficacy in CU. Gushchin et al . reported positive results among forty patients with CU after administering six subcutaneous injections of histaglobulin. The role of corticosteroids in CU is limited. However, for acute exacerbation of chronic spontaneous urticaria, a short course of corticosteroids (3–7 days) was found to be helpful.,, As per the recent European Academy of Allergy and Clinical Immunology (EACCI) guidelines, the strength of recommendation for steroids is weak. It is also limited by various dose- and time-dependent side effects. Cyclosporin has a better risk-benefit ratio compared to steroids. It is recommended only for patients with severe disease refractory to any dose of antihistamines. Various studies have established the effectiveness of low-dose cyclosporin. Yet its serious side effects (nephrotoxicity and hypertension) and the requirement to monitor the blood pressure, renal function, and electrolytes precludes its use as the standard treatment for CU. Efficacy and tolerance of omalizumab have been well demonstrated in various randomized control trials (RCTs). One such trial conducted by Maurer et al . demonstrated good efficacy at monthly doses of 150 mg and 300 mg over a 12-week period with low toxicity. However, the quality of evidence is very low and the strength of recommendation for this drug is also weak, as per the EACCI guidelines. There are no RCTs published on the usage of methotrexate. A retrospective analysis conducted by Perez et al . concluded that it can be used in chronic steroid-dependent urticaria and should be considered as an alternative to other third-line drugs, such as cyclosporin. There are two studies from India which demonstrated the efficacy of autologous serum therapy in reducing the severity of urticaria and the number of antihistamines required., Another study by Majid et al . did not show favorable results. [Table 4] compares the effectiveness of various immunological agents from various studies. This study proves the effectiveness of weekly histaglobulin injection in producing long-term relief among patients with CU. The drug produced 80% reduction in the disease activity by 8 weeks. Complete long-term remission was achieved in 45% of patients who were enrolled into the study. The drug had its onset of action from the 1st week onward while more than 50% reduction in disease activity was observed by the 2nd week of follow-up. The overall weekly requirement of oral antihistamine reduced to <2/week and the effect of histaglobulin persisted even after 4 months of stopping the therapy. The long-term effect was evident from the sustained low levels of UAS scores and remission observed among 23 patients at 24 weeks. This study was not designed to study the effect of histaglobulin in comparison with that of a placebo or a standard treatment. Lack of a control arm in this study is a limiting factor that was governed by ethical concerns. All patients included in the study suffered from CU and were highly symptomatic. Administering a placebo to these patients would raise ethical concerns. However, controlled prospective studies need to be carried out to establish the efficacy of this drug. Though there was a dropout of subjects, post hoc power analysis showed no compromise in the power of the study (power [1− ß err prob] = 99.97). Patients of CU perceived a significant improvement in symptoms during the treatment period and it produced long-term remission too. No adverse effects were observed with the drug. Histaglobulin may thus be a viable alternative to the existing treatment modalities. Yadav S, Upadhyay A, Bajaj AK. Chronic urticaria: An overview. Indian J Dermatol 2006;51:171-7. Powell RJ, Leech SC, Till S, Huber PA, Nasser SM, Clark AT. BSACI guideline for the management of chronic urticaria and angioedema. Clin Exp Allergy 2015;45:547-65. Tseng JT, Lee WR, Lin SS, Hsu CH, Yang HH, Wang KH, et al. 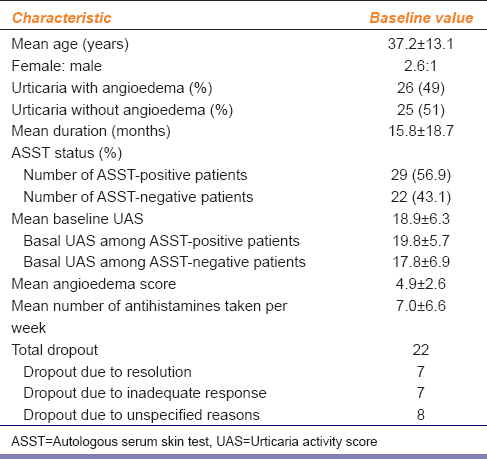 Autologous serum skin test and autologous whole blood injections to patients with chronic urticaria: A retrospective analysis. Dermatolog Sin 2009;27:27-36. Konstantinou GN, Asero R, Maurer M, Sabroe RA, Schmid-Grendelmeier P, Grattan CE. EAACI/GA (2) LEN task force consensus report: The autologous serum skin test in urticaria. Allergy 2009;64:1256-68. HISTOGLOB (Histaglobulin). Bharat Serums and Vaccines Limited., Ambernath, India; 2012. Kaplan AP. Treatment of chronic spontaneous urticaria. Allergy Asthma Immunol Res 2012;4:326-31. Jurakic Toncic R, Lipozencic J, Marinovic B. Treatment of chronic urticaria. Acta Dermatovenerol Croat 2009;17:305-22. Zuberbier T, Asero R, Bindslev-Jensen C, Walter Canonica G, Church MK, Giménez-Arnau AM, et al. EAACI/GA (2) LEN/EDF/WAO guideline: Management of urticaria. Allergy 2009;64:1427-43. Debbarman P, Sil A, Datta PK, Bandyopadhyay D, Das NK. Autologous serum therapy in chronic urticaria: A promising complement to antihistamines. Indian J Dermatol 2014;59:375-82. Shi C, Li Y, Luo Y, Shi C, Yan X, Yang K, et al. IgE-mediated allergy: A rare cause of chronic spontaneous urticarial with allergen-specific immunotherapy as treatment option – A systematic review with meta-analysis from China. J Eur Acad Dermatol Venereol 2012;26:533-44. Mohanty M, Mohapatra S, Pattnaik KP, Swain TR. Prevention of multiple drug allergy by histaglobulin. Indian J Pharmacol 2006;38:68-9. Yoshii H, Fukata-Yamazaki Y, Yamamoto K, Yago H, Yanagihara Y, Okudaira H. A complex of histamine/mouse gamma-globulin preferentially inhibits allergen-induced peritoneal accumulation of eosinophils, but not neutrophils, in mice. J Allergy Clin Immunol 1997;100(6 Pt 1):809-16. Narayana J, Shanthi T, Bharadwaj S. Efficacy of histaglobulin on allergic rhinitis. Indian J Otolaryngol Head Neck Surg 1997;49:77-9. Gushchin IS, Luss LV, Il'ina NI, Larina ON, Pakhomova LA. Therapeutic effectiveness of histaglobin preparations in patients with allergic rhinitis and chronic urticaria. Ter Arkh 1999;71:57-62. Asero R, Tedeschi A. Usefulness of a short course of oral prednisone in antihistamine-resistant chronic urticaria: A retrospective analysis. J Investig Allergol Clin Immunol 2010;20:386-90. Toubi E, Blant A, Kessel A, Golan TD. Low-dose cyclosporin A in the treatment of severe chronic idiopathic urticaria. Allergy 1997;52:312-6. Cooke A, Bulkhi A, Casale TB. 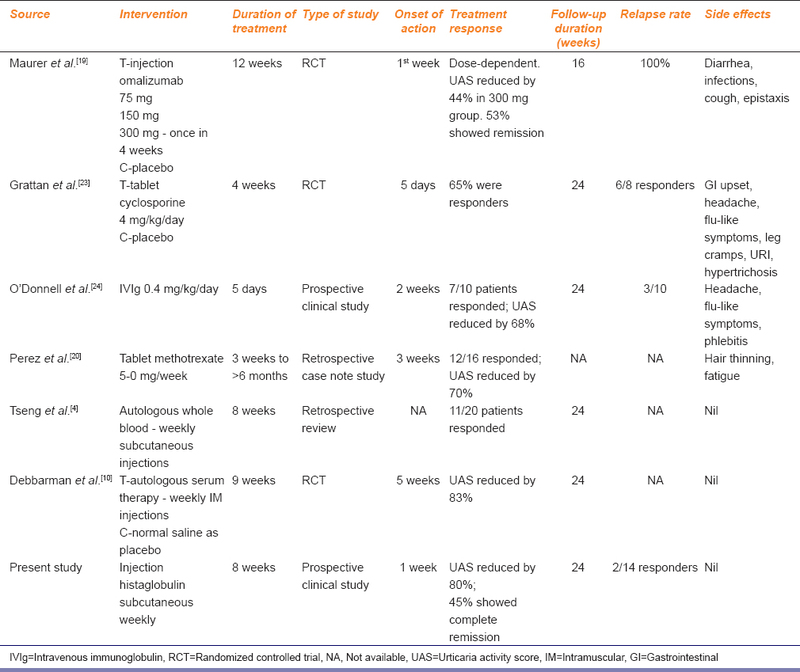 Biologics: Targets and therapy role of biologics in intractable urticaria. Biol Targets Ther 2015;9:25-33. Maurer M, Rosén K, Hsieh HJ, Saini S, Grattan C, Gimenéz-Arnau A, et al. Omalizumab for the treatment of chronic idiopathic or spontaneous urticaria. N Engl J Med 2013;368:924-35. Perez A, Woods A, Grattan CE. Methotrexate: A useful steroid-sparing agent in recalcitrant chronic urticaria. Br J Dermatol 2010;162:191-4. Bajaj AK, Saraswat A, Upadhyay A, Damisetty R, Dhar S. Autologous serum therapy in chronic urticaria: Old wine in a new bottle. Indian J Dermatol Venereol Leprol 2008;74:109-13. Majid I, Shah S, Hassan A, Aleem S, Aziz K. How effective is autologous serum therapy in chronic autoimmune urticaria. Indian J Dermatol 2015;60:102. Grattan CE, O'Donnell BF, Francis DM, Niimi N, Barlow RJ, Seed PT, et al. Randomized double-blind study of cyclosporin in chronic 'idiopathic' urticaria. Br J Dermatol 2000;143:365-72. O'Donnell BF, Barr RM, Black AK, Francis DM, Kermani F, Niimi N, et al. Intravenous immunoglobulin in autoimmune chronic urticaria. Br J Dermatol 1998;138:101-6.